Keeping your lawn healthy and free of pests or diseases is a high priority for turf owners. That’s why it’s important to try to spot diseases early so you don’t end up with more damage than you need. Lawn disease often starts because of environmental stresses, such as abrupt weather changes or excessively wet or dry climates. Here are a few common lawn diseases, how to spot them, and what to do about them. What it looks like: Fairy ring is a common affliction for turf grasses. A ring of discolouration will develop around a patch of grass sometimes caused by a fungus. It is most commonly between half a metre to 5 meters in diameter, and may toadstools growing or may simply have an area of darker grass. 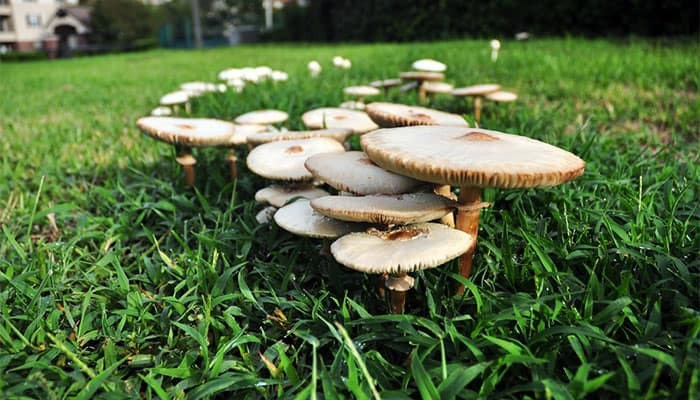 What to do: It is rare that fairy ring is actually deadly to the rest of the turf, but mushrooms that grow may have poisonous properties. If there are mushrooms, carefully remove all of them and rake thoroughly. If there are none, simply deal with the disease as cosmetic and compensate by watering and fertilising the nearby areas a little extra. What it looks like: Individual grass blades will have one or several oblong patches on them, with a dark brown rim and a pale brown, grey, or olive coloured inside. Patches of grass may be discoloured, pale, and brownish. If left untreated, this can severely damage the lawn and create large patches of dead turf. This is a fungal disease and spreads quickly. What to do: What you do depends on how quickly you spot the disease. If it is still confined to a small patch of grass, turn up the soil and reseed. If it has already spread, you’ll need to use a fungicide to get rid of the leaf spot disease. Using a grass that is disease resistant in the first place can help avoid leaf spots. What it looks like: Pythium Blight, also known as “grease spots” is most common in muggy, humid weather. Grass develops spots that appear water-soaked, then shrivelled. As this is a fungus, it’s common for small, white, cobwebby mould to appear in clusters or streaks. Within a short period of time (sometimes even just days) a lawn can be overrun with pythium blight and turn a faded light brown. What to do: Pythium blight is a deadly killer for grass and the fungus can live in dead grass for multiple seasons if not eradicated. If you live in a pythium-friendly area, consider preventative fungicide. Otherwise, you may need to use a fairly harsh fungicide to get rid of the blight. What it looks like: Slime mould is a single celled organism that grows in colonies, often on wet mulch or damp grass. A brown, yellow, pink, or white ring of slime will grow, sometimes reaching more than half a meter in diameter. What to do: Despite their unsightly appearance, slime moulds are not all that harmful to grass. They are common in wet conditions, so if you remove the mould but conditions are still present, it may reappear. You can remove it by raking or upturning the area, and throwing it in the trash. Keeping a healthy lawn takes some work, so you don’t want all of that hard work to disappear with a disease. Learn to spot diseases right away, and take preventative measures like mowing and watering your lawn the recommended amounts for your area and weather. Using a quality turf supply is the first step to a disease free lawn.